She did send us a photograph that she took of her bathroom vanity. We aren’t quite sure what we are looking at. 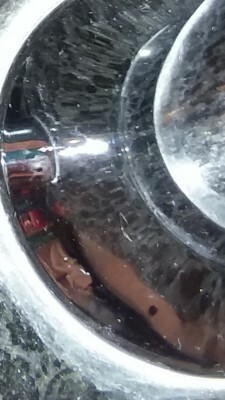 In the middle of the picture about 2/3 down from the top, there might be a small worm-like organism, but we aren’t too sure. Instead, we are going to go off the information our reader provided, since she wrote us such a helpful, detailed message. 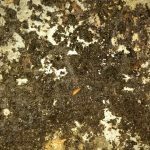 According to our reader’s message, she is dealing with clothes moths and case bearing moths, and their larvae. Clothes moths and case bearing moths are actually both types of clothes moths, and both are found in North America. The creatures our reader refers to as clothes moths are webbing clothes moths (Tineola bisselliella) and the case bearing moths go by a few different names, including casemaking clothes moth (Tinea pellionella.) For the sake of avoiding confusion, in this article we will refer to these creatures as webbing clothes moths and case bearing moths. 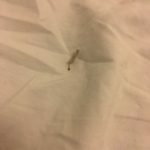 These moths are known for feeding on fabrics and materials that contain animal fibers such as silk, wool, felt, leather, and fur, causing damage and sometimes ruining items, as our reader has experienced. However, it is actually the larvae, not the moths, that eat and cause the damage. Webbing clothes moth larvae spin silken tubes or patches of webbing as they graze on infested materials. They aren’t often seen since they prefer to feed within the folds of fabrics and in concealed areas. 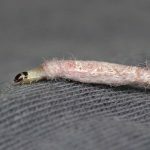 Case bearing moth larvae also spin silken tubular cases, which they live inside as they mature, dragging the case behind them wherever they go. The outside of this case collects dust, dirt, sand, and other small particles, giving it a protective shell layer on the outside, and remaining silky on the inside. 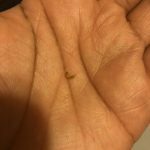 As our reader knows first hand, getting rid of these larvae is a real headache. She will need to go through all infested items in all areas where she thinks these moths and larvae might be present. Anything that has been infested and/or damaged should either be thrown out, dry cleaned, or laundered. Since she has found these moths in so many rooms of her home, it is probably smart to wash all materials. In addition to doing laundry, she needs to sweep, vacuum, and dust every day to keep the small particles around her home to a minimum. We can offer her one tip that might make this task a little easier. She can purchase some diatomaceous earth (D.E. for short) and sprinkle it around her home, focusing especially on the infested areas. D.E. is a powder made up of the remains of marine phytoplankton. It kills small insects but is completely harmless if eaten or touched by humans and/or pets. 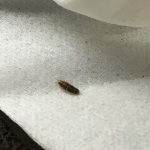 Before we sign off, we want to mention that there is another common household pest with similar eating habits as clothes moths: carpet beetle larvae. 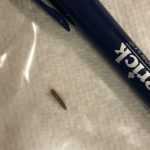 While our reader specifically mentioned moths, it is possible she is also dealing with carpet beetle larvae, since they cause the same sort of damage in a home. Luckily, getting rid of carpet beetle larvae requires the same cleaning tasks as eliminating clothes moths. 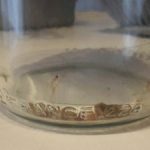 We hope our reader finds this article helpful and that her home returns to a moth-free and larvae-free space. We wish her the best of luck! 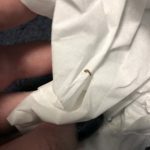 Our reader is dealing with clothes moths and case bearing moths, and their larvae. Clothes moths and case bearing moths are actually both types of clothes moths, and both are found in North America.